There is no question your children are the best. Show them off with our Life Is Sweeter Personalized Grandma Shirts. Show the warmth, love and support with these gifts for Grandma, Nana, Gram, Granny or Mom. Now your very important Nana can proudly show off the whole family on her attractive personalized T-shirt. Your Personalized T-shirt is available on our premium white, pink or ash gray 100% cotton t-shirt, machine washable in adult sizes S-3XL. All of our personalized shirts include FREE Personalization. Create your own Personalized T-shirt with up to 30 names and any title. Very cute, though I wish some of the lighter colored candies would have been used for my grandchildren’s names instead of the darker candies. The children’s names at hard to read on the darker colored ones. love the color and the personalization. My grandkids love seeing their names on my shirts. Take a peak at our entire collection of Personalized T-Shirts. Create a custom T-shirt for someone in your family today. 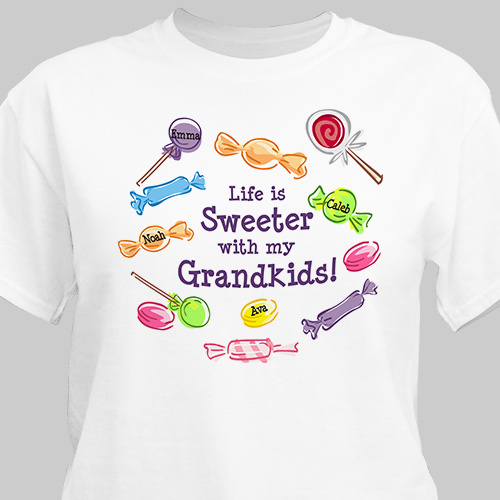 Mom, Dad, Sister, Brother, Grandma or Grandpa will love this wonderful t-shirt which you have personalized just for them. GiftsForYouNow offers many unique gifts for Grandma, Mom and your friends. Some of our most popular Friendship gifts are our Personalized Friendship Frames, Friendship shirts & of course our Personalized Friendship Keepsakes.